Let's chat about what we've read this week. 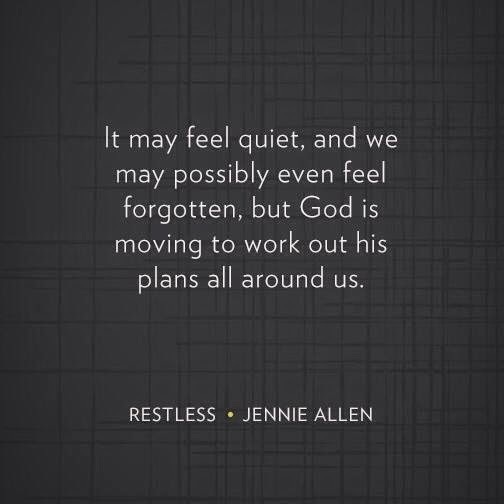 OR if you haven't read - there are still some great questions to discuss from the first seven chapters of Restless by Jennie Allen. But first...our small group snack. I've been obsessed with super synced dancing since my friend Jen Clapp shared this treasure with me. In Part One, Jennie presents up "The Call." She sets up how we are called to dream, called to surrender, and called to run the race. It's a great introduction to what God has plotted out for us. Here are questions to ponder. Answer as few or as many as you like in the comments. What was your favorite sentence or passage or idea in Part One? My favorite sentence was on page 6: "I want you to dare to believe that God has a vision for how you are to spend your life." It's the paraphrase of John 10:10 when Jesus says "The thief comes only to steal and kill and destroy; I have come that they may have life, and have it to the full." Our lives, our years, TODAY isn't just something to get through. Can you know God's purpose? I'm going to answer this question with a question: How does God benefit...how is He glorified by hiding His will for us? Do you know people who seem to be walking in God's purpose for their lives? What makes them different? When I made my list of folks who seem to be camped out in God's will, a common thread appeared: courage. Courage to speak or courage to act. Fear almost seems imperceptible in their lives. Although it's not the absence of fear, just the pushing through it to the other side, right? Are you surrounded by dreamers in your life? I try to avoid friendships with those who bring drama. I crave those who balance thoughtful consideration with smiley emojis. When I told my friends I was quitting my job, they pondered and prayed and then high fived the decision. Because my closest friends are dreamers. Even my logical and bottom-line family members have wrapped most of their questions in encouragement. Another question answered with a question: Do you remember dreaming as a child and now those dreams seem long gone? In Chapter 7, Jennie provides the running parable in which she shares four starting places. Where are you in the race? A. Numb: Busy, surviving, somewhat content. B. Thirsty: Not satisfied, don't know what to do about it. C. Running Free: living it, feeling purpose, seeing God move. D. At The Starting Line: don't really know God or have a personal relationship with him. Start here. For me, I feel I'm running free. However, I also thought I signed up for a sprint and I'M ON MILE SEVENTEEN. My favorite response to this from our IRL Restless meeting was: "My life is full, but it isn't really fulfilling." Now, get thee to the comments and share your answers and thoughts. Also, feel free to email me at jamiesrabbits @ gmail.com for some one-on-one. This week's reading assignment: Chapters 8-13. We're getting to the heart of the matter. Write down anything that punches you in the gut or furrows your brow and we'll chat it through on next week's post. If you'd like to catch up and join us: Read the first chapter of Restless here and click "Look Inside."